In the years immediately following the First Sobor, there was stability and remarkable growth in the North American Church, but the Russian Revolution of 1917 created great turmoil for Orthodoxy in North America. Archbishop EVDOKIM (Meshchersky), ruling hierarch of the North American Church from 1914 to 1918, had gone to Russia to attend the All-Russian Church Council of 1917-18. This council restored the Patriarchal system of ecclesiastical governance and elected Saint TIKHON, former head of the North American Diocese, as the first Patriarch of the Russian Church in more than two centuries. The Bolshevik Revolution, which occurred simultaneously, resulted in great upheaval and persecution for the Church and throughout Russia. Because of this, Archbishop EVDOKIM, who would later join the schismatic “Living Church,” was unable to return to his see in North America. Before his departure, he had appointed auxiliary Bishop ALEXANDER (Nemolovsky) of Canada to temporarily administer the diocese. The revolution in Russia severely impaired the administration of the North American Church. Funding from Russia was immediately cut off and regular communication with church and state authorities in Russia became nearly impossible. Preliminary preparations for the Second All-American Sobor had already begun before Archbishop EVDOKIM’s departure from America. The crisis in the North American Church following the Bolshevik Revolution and the absence of a permanent ruling hierarch in the diocese made the convocation of the council even more crucial and urgent. Unfortunately, financial hardship prevented its immediate convocation. The council was finally able to assemble on February 25-28, 1919 in Cleveland, OH. As Archbishop EVDOKIM was obviously not returning to America and a successor could not be appointed from Russia, the council decided to proceed with the election of a ruling hierarch. Bishop ALEXANDER was almost unanimously elected and raised to the rank of Archbishop. 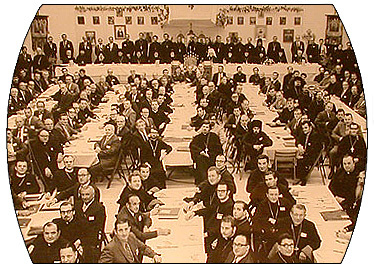 Following this first election of its own ruling hierarch by the North American Church, the Second Sobor established administrative structures for the diocese, took measures to alleviate the financial crisis and also deliberated several issues related to the multiethnic composition of the diocese. The historical importance of this council lies in the election of Archbishop ALEXANDER. This election set a precedent for future elections of the Church’s Primates by later councils.